Sir Charle is the son of Princess DiJean of M&M and FLL Windstorm. He was raised by the Sisters at the Monastery Llama Ranch in North Dakota after his mother died of cancer, and we were fortunate to buy him in his third year. What a Joker! 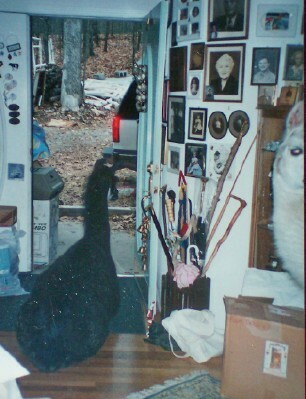 The first day the llamas were here, we had to leave the homefront and wanted to have them closer to the house in the catch pen, so Mom went out in her Sunday Best to chase them into the catch pen. Charle made her run in circles for about ten minutes, and then Mom slipped and fell flat on the ground. At which point Sir Charle turned on his heel, went into the catch pen, and stood there waiting for Mom to close the gate. He had never meant to hurt her. 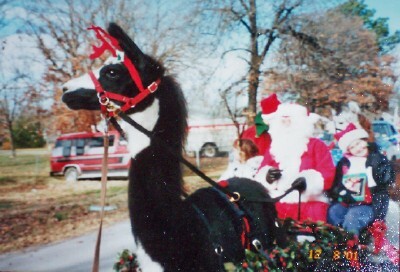 Here are the Llamas, Sir Charle and Magical Flag, ready for the Ketchum, Oklahoma Christmas parade, a lighted parade, December 7th, 2008. The float is another of Mom's art projects. 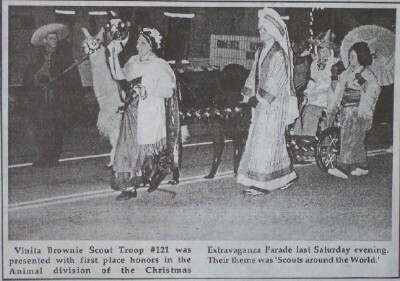 More pictures of the parade on Mom's page. 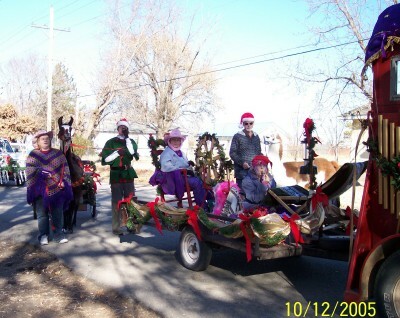 Sir Charle has pulled our llama cart in parades since 2000, and won many prizes from the local communities. 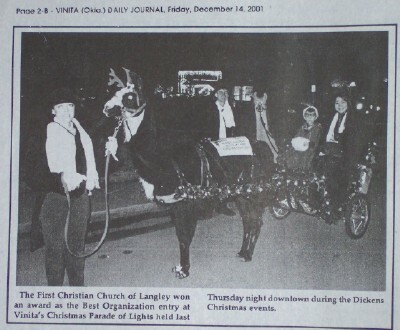 In 2001 we entered three parades, in three completely different sets of costumes (because of the three different parade themes) and won prizes in all three categories. Most years we try to stick to one design and theme, Mom gets pretty worn out costuming everyone three times while preparing for Christmas, but it sure is alot of fun. Her favorite time of year: Halloween through Christmas, with all the costumes! Sir Charle is about as different from Magical Flag as a creature can get within the same species. 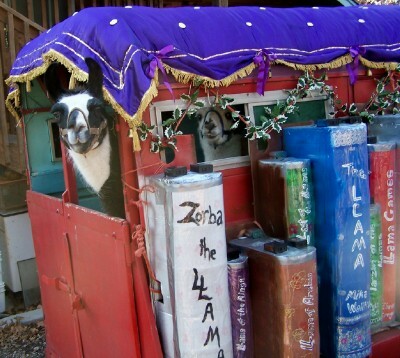 'Charle demands that he be groomed and takes great pride in pulling the Llama Cart in the Christmas parades each year. His mother was Princess DiJean, and you can tell it from the way Sir Charle's attitude manifests. He loves adulation and public appearances. MINK claims Sir Charle as her llama, Kimball belongs to Magical Flag. Ah yes, Sir Charle... Elbow, elbow, wrist, wrist, wrist...When the weather changes he starts waiting by the gate, looking foreward to the change of scenery and excitement of all the people. 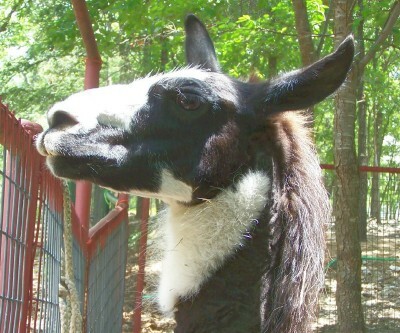 This is a portrait from life of our younger Llama, Magical Flag. As you can see from his portrait, He does NOT like having his hair cut. Magical Flag was about two years old when this portrait was drawn. He was having his wool sheared for the hot summer in Oklahoma, which is not like the cold mountains of the Andes where the llamas originally lived. 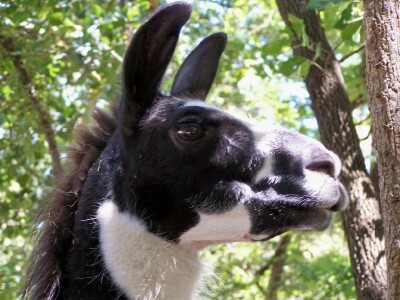 Llamas have wool with no oil, it does not smell when it gets wet. Llama wool does not shrink, garments made of llama wool can be washed with the rest of the laundry and dried in the dryer. 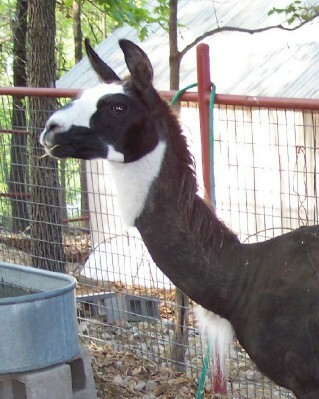 Llamas will fight off dogs and other predators. 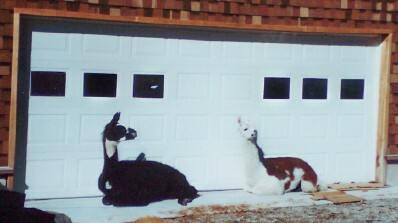 Many people keep llamas with their sheep or goats. 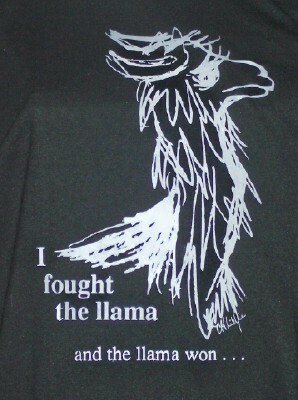 But llamas are not invincible, and do better in a small group. Dogs can kill a lone llama. We have two geldings so they can keep each other company. Llamas like to be part of an herd, and become lonely and pine if they are all alone. As for fighting the llama, we were completely won-over by them, and have been very glad we made the decision to have Magical Flag and Sir Charle join our family. 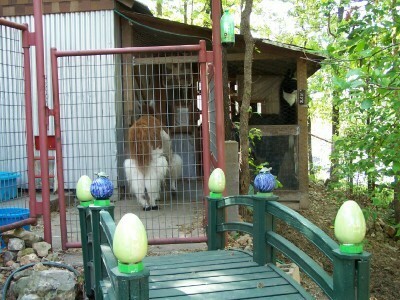 The llamas won our hearts, even this one who dislikes being groomed, and, Yes, Those are two llamas in our living room.